Here's one of the new designs in my Spoonflower.com shop. 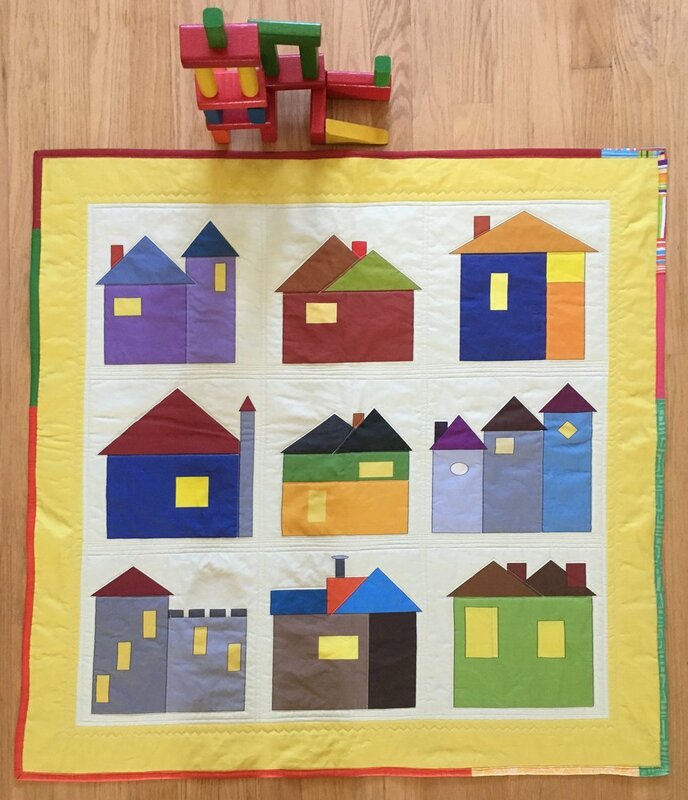 This is a quilt panel with my Storybook Houses design and a 3 inch wide border. 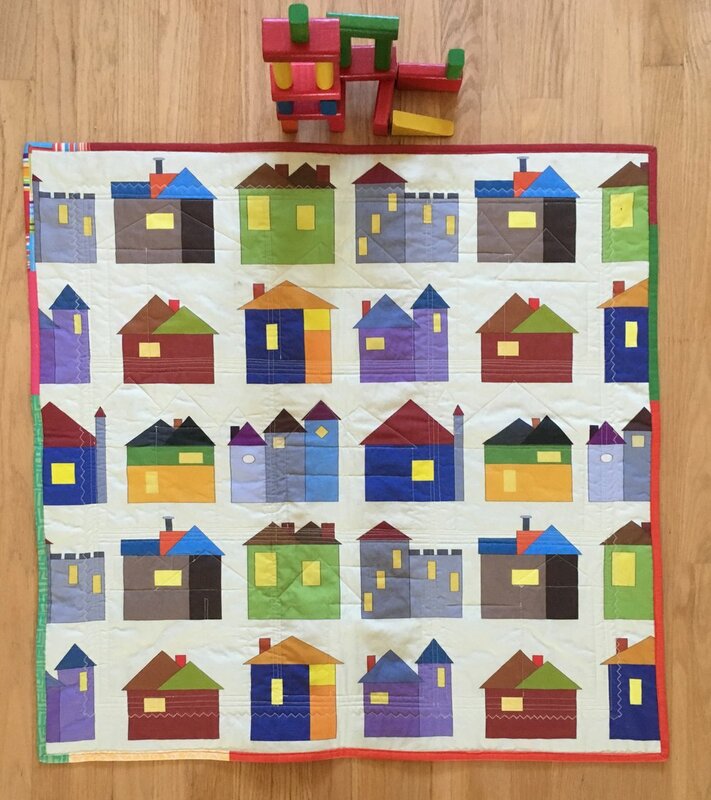 It's not a cheater quilt because there aren't any printed stitch lines, but it is an easy quilt that could be completed in an afternoon if you suddenly need a baby present! I quilted the quilt above with all straight line stitches and the wavy Bernina stitch #4. 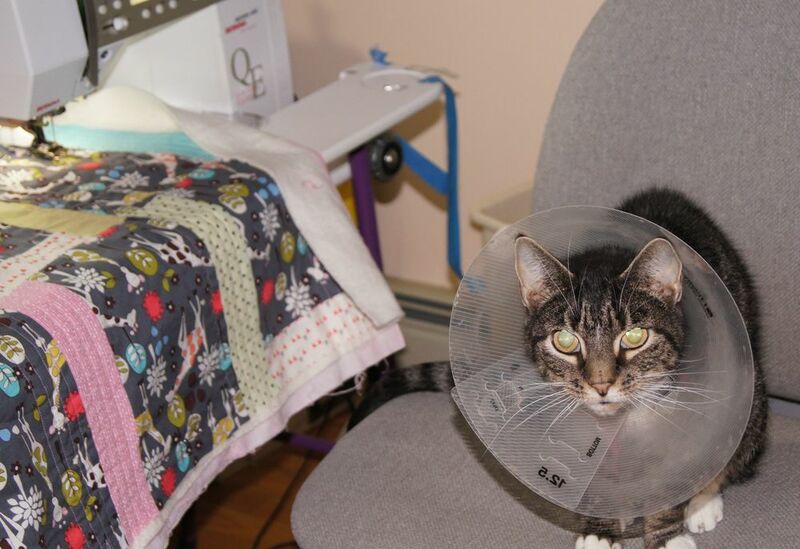 You don't looks need any fancy quilting skills to make this quilt look great! However, if you have free motion quilting skills, it would also be lots of fun to stitch shingles, stones and siding designs on the houses! There is coordinating fabric with an all-over house design with slight smaller houses that makes a great backing. I finished the quilt with a scrappy binding using pieces and pieces left over from binding other quilts. I love the look and I love using up the leftovers! Because the quilt panel is just 35 inches wide and the fabric is 43 inches wide, there are 5 1/2 inches of extra yellow border color printed 1 yard of panel fabric. This extra yellow fabric is just long enough so it could be cut at 2 1/2 x 35 inches for use as horizontal sashing between the rows of houses. That would make a quilt that is slightly rectangular rather than square a bit larger. I made this quilt using the Ultra Kona® Cotton option available at Spoonflower.com. The Ultra Kona® is a fairly recent upgrade and it takes the dyes much better than the Kona® previously available. This design was fun to draw and it was lots of fun to quilt. Hope you like it!! 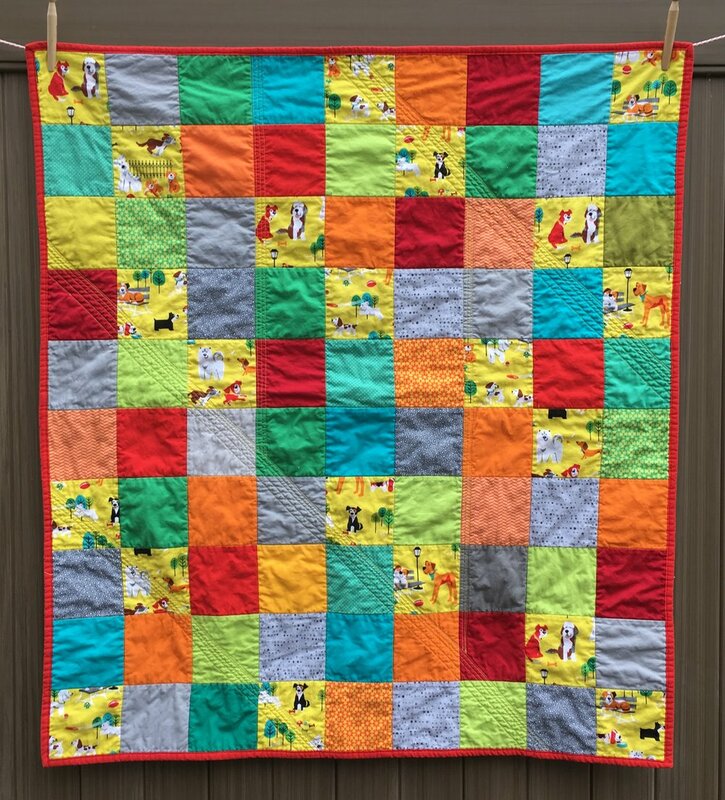 Charm Square Baby Quilt with Dogs and Bright Colors, "Dogs + Sunshine"
A fellow Boston Modern Guild member gave me this "Dog Park" fabric designed by Sarah Frederking for Studio E fabrics. She said as soon as she saw it, she thought of me! How great is that!! Another friend, who also loves dogs, is having a baby soon. They don't know if it's a boy or a girl so for her baby quilt needs to be gender neutral. As soon as I saw this dog fabric, I knew they'd love it! I cut the charm squares (5 x 5 inches patches) to match the colors in the doggie feature fabric. 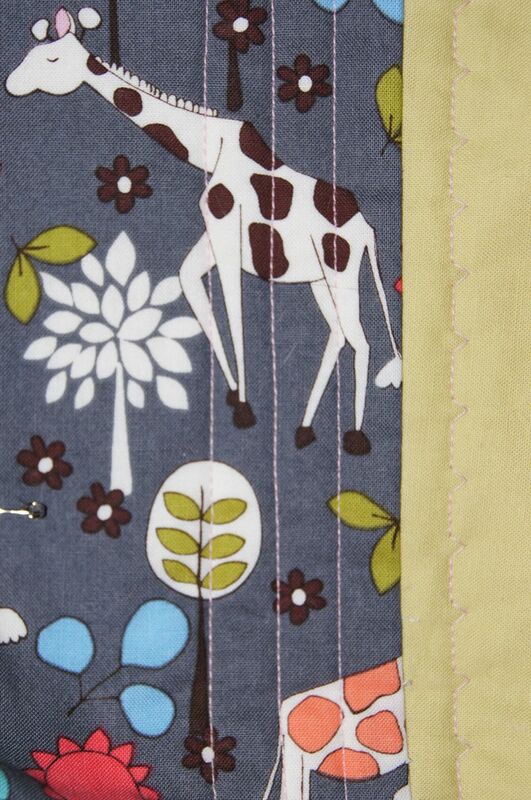 The patches of "Dog Park" fabric are in diagonal pairs, randomly placed in the quilt top. I love how bright and cheerful this quilt is! The quilting is stitch-in-the-ditch with a walking foot across the entire grid of blocks. Then I added 3 sections of diagonal stitching and two more sections of vertical stitching running between the top and middle diagonals. The added quilting gives this simple quilt an interesting texture, more visible in the photos since it's already be washed. 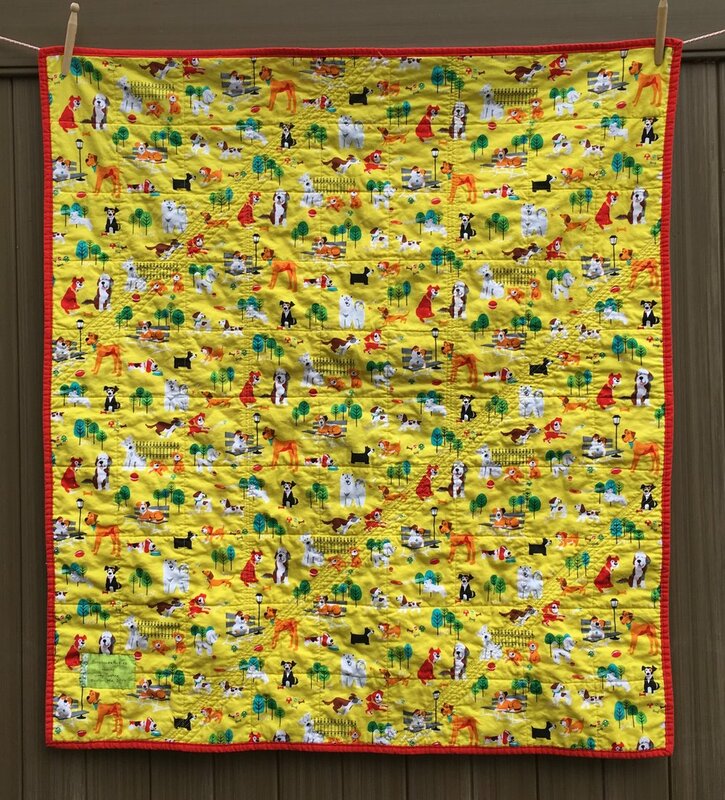 I used the "Dog Park" fabric for the backing of the quilt. 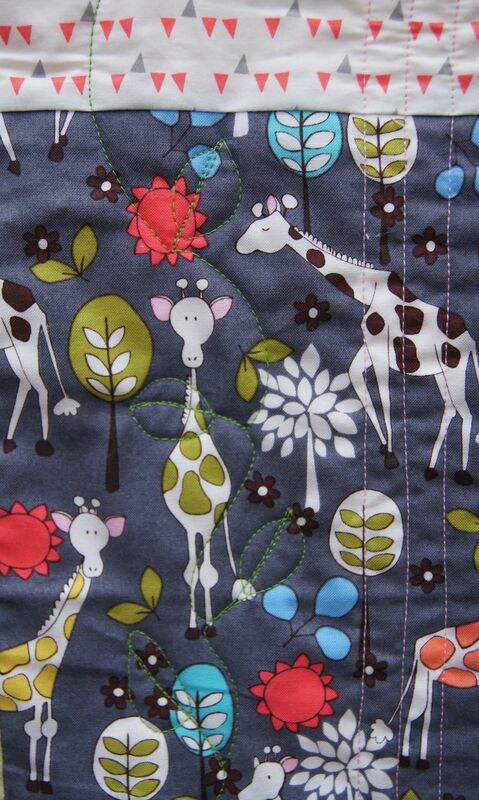 This makes it a fun, reversible baby quilt! I can't wait to see what my friend thinks of this quilt I made for her baby! All done! The "Busy Beach Town" quilt is finished! I used a blue/green/lavender variegated thread for a free motion loops-and-stars quilting pattern. And I incorporated a couple scraps from the quilt into the solid grey binding. 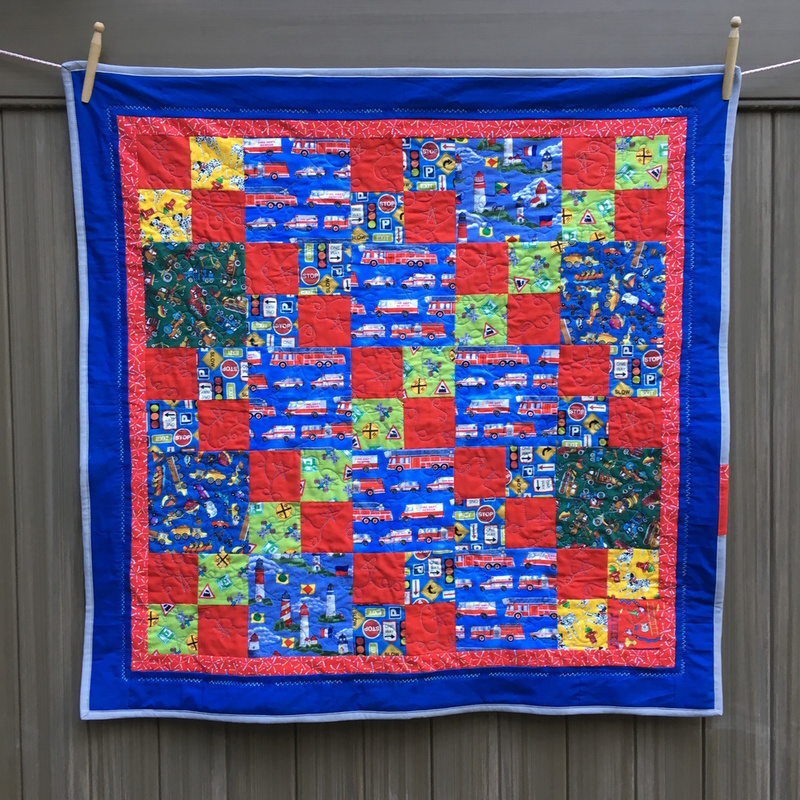 The front of this quilt will be good for floor time when the baby is an infant, and play time when he's old enough to have a garage full of toy cars and trucks! Fun times! This is my "Busy Beach Town" baby quilt top, ready to be quilted. It's small, a good size for using for floor time for a baby or for a toddler to drag around. The Four Square patches create red chains in one direction, a safety green in the other. There are also 2 blue chains that blend in with the bigger blocks and aren't really evident. It is a busy beach town! Child's delight--rail crossings, construction trucks, fire engines, ambulances, Dalmations! Maybe NOT an adult's idea of quiet vacation, but if you look carefully, you'll see some river rafting and a coupe sailboats in the large blue blocks, and of course the lighthouses! So a little something to make everyone happy on an August afternoon in a beach town! I saw one of my neighbors while walking the dogs this past week. They are expecting a baby this fall and I asked when the new little one is due--soon! I thought I had til October! Time to make to baby quilt! I know the baby is a boy so I was planning a Fireman Quilt. 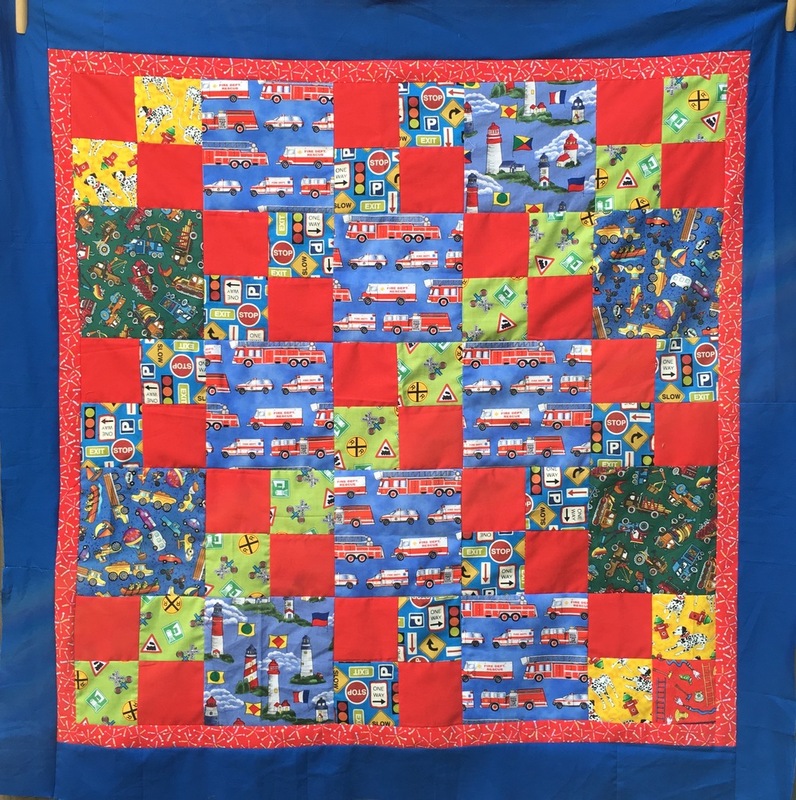 But when I looked through my stash of novelty fabrics I realized the blue background of the lighthouse fabric was a great match for the blue in the emergency vehicle fabric. And I liked the tossed trucks in blue and green. It is August--I must be thinking about vacations! At any rate, the quilt morphed into a Busy Beach Town quilt! With four patch blocks making a simple chain and larger blocks with the feature fabrics, this is going to be a fun, and fast, quilt to make!